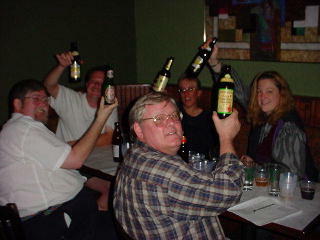 Owen Ogletree (director of Brewtopia Events) gathered together some of his fellow beer lovers in October of 2001 at Athens' Burntstone Brewhouse to sample and comment on several German beers available in Georgia through Thunderhead Distribution wholesale beer distributor. This beer sampling was done as a blind tasting where each style was revealed, but no one was aware of the brands that were being served. 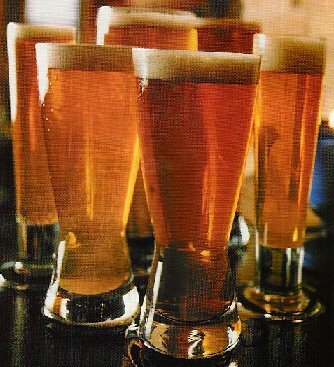 Beers were informally commented upon and ranked according to American Homebrewers Association (AHA) style guidelines. First, second, third place, and honorable mention were awarded to the beers we felt represented their styles in extraordinary fashion. Drop Owen an email to share your comments and opinions. Beers were presented in five ounce samples on top of white paper for note taking. Each beer was judged according to published style guidelines. (L to R): Johnnie Sutherland, Mark King, Lari Cowgill, Joanne Maki, and Kerri Allen (Owen Ogletree is not pictured). We'd like to thank Thunderhead Distribution for supplying these fine beers! Aroma of malt, toffee, plum -- sweet smells. Deep amber in color and clear. Mouthfeel is medium with low carbonation. Flavor is wonderful -- rich, complex, caramel, malt. Hop presence is low. This is a splendid Bock. A beautiful beer with an aroma of toasted grain and molasses. Appearance is dark amber with a flavor that is dominated by toast, honey, and a hint of chocolate. Hops are very well balanced with the malt. There is a hint of burnt character -- rich and complex. This beer has a great head and an aroma of cloves and light banana esters. Flavor is slightly tart and refreshing with fruity, citrusy components. There is a nice body with a hint of spicy cloves. Is there a hint of soapy character somewhere? Appearance is a beautiful cloudy, light golden color. Very nice Bavarian wheat beer. This is a very interesting lager that has a nice golden color. Aroma is fruity with plum and wine characters. Flavors include white wine, mead, honey, rhubarb. There is a hint of phenolic character that would probably be found in an ancient beer style. This is very fruity with weizen-like phenols. Sweet and malty, this is a very intriguing beer. This Koelsch tied for honorable mention. Golden and sparkling in appearance. It has a floral, German noble hop aroma and low malt smell. There is a hint of fruitiness and a background of tea, earthiness, and hops in the aroma and flavor. A good representative of the Koelsch style. It has a hint of corn in the flavor as it warms. There is a slight sweetness and no diacetyl. Mouthfeel is on the light side of medium. Aroma is a bit grainy with a hint of flowery noble hops. Flavor is crisp and a bit dry with a lighter than expected body. There is too little bitterness in the aftertaste. A clean, golden lager. There is a very light aroma of esters. The body is a bit light for style (watery). There are flavors of citrus, salt, minerals, wheat, and a hint of metallic character. A very light version of a Bavarian Hefe-Weizen -- needs more complexity. Color is on the dark end of scale for a Bavarian wheat beer. Aroma is of wheat, clove, phenols -- complex and enticing. Flavor is a bit lacking in fullness. There is a nice wheat flavor. This bottle does not exhibit an intense spicy, estery character needed for the style. The aroma is fruity and caramel. Appearance is a beautiful amber with a nice cloudiness. Flavor is caramel and a bit sweet. There is no roasty character and very little Munich-malt melanoidin/toast component. Carbonation is moderate. There is a hint of apple-like flavor. Not extremely complex -- needs more spice, clove, phenolic character. It is dark and malty with nice wheat accents. Color is amber -- clear and attractive. Aroma is of beechwood smoke. Flavor has a hint of wheat, but smoke predominates. The balance is OK compared to many other strongly smoked beers, but it could benefit from more Bavarian wheat character. A flavorful beer that could take some getting used to.